Pupils are prepared for both Graded and Vocational examinations. 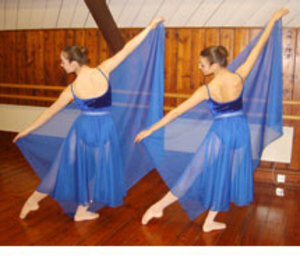 Examination sessions are arranged throughout the year with the Royal Academy of Dance and Imperial Society of Teachers of Dance. The school has a 100% success rate in the Graded examinations with the majority of pupils gaining high Merits and Distinctions. We have also offer LAMDA exams (Drama). As well as examinations, throughout the year the school is regularly involved in Cabaret performances, Pantomimes, Festivals and Workshops led by West End Artistes and Choreographers. Choreography Competitions are held annually in order to encourage the pupils to try out their own ideas on stage. At the end of the summer term we host a demonstration of work with a presentation of certificates and school awards, giving all pupils the opportunity to dance on stage! The school has close links with Witney's twin town, Unterhaching, Germany, and has toured there three times performing in concerts and shows. "Dreams can come true: you can do whatever you really want to do, if you try hard enough and point your toes!"